NASA New Horizons space probe has been about and around the faraway space rock called the Ultima Thule – which we thought was a more rounded rock similar to a snowman – but new data sent back by the probe shows that it might be a celestial body as flat as a pancake. 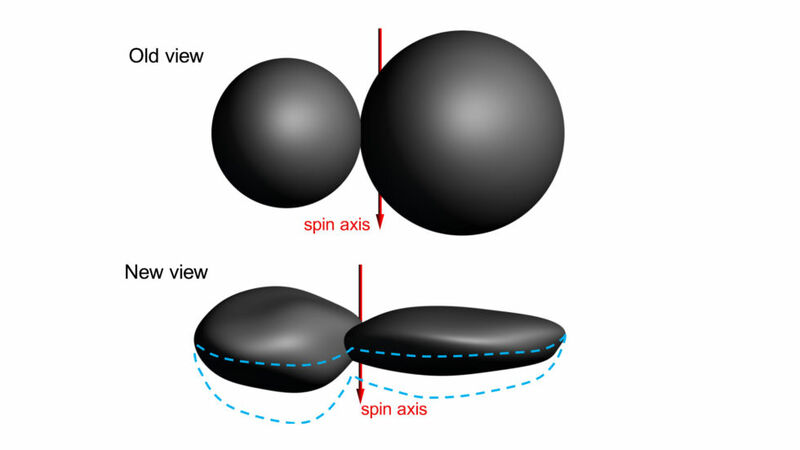 Once dubbed to be a frosty space snowman like structure made up of two roughly rounded lobed spheres, the Ultima Thule actually turned out to be much flatter on the back side than thought – almost “like a pancake” as per the new data sent by New Horizons. On New Year’s, the NASA probe had evidently taken a tour around the Ultima Thule located about 6.4 billion kilometres from earth, in the Kuiper Belt which is about 1 billion miles past dwarf-planet Pluto. Back in 2015, Horizons had visited around the cosmic rock and researchers thought of it to be a rounded body – but the 14 images taken by New Horizons during its 10 minutes closest pass-by were strung together to trace an outline of 2014 MU69. As per the final outline, the “Ultima”, which is the larger of the two lobes turned out to be more like one of those excessively fluffy pancakes, while the “Thule” – the smaller lobe looks like a disappointingly deflated party balloon (or “dented walnut”, according to researchers). So before you get confused, when the space rock is seen from front, it still looks like a two-ball snowman. But from the side, the snowman gets pretty squished, almost like a lemon and pie stuck together, end to end. But beyond the unusual shape of Ultima Thule, the new finding is creating a puzzle for scientists about how such an object could even be formed – as such a flattened object has never been seen orbiting the sun. Perhaps, “We are seeing a physical representation of the beginning of planetary formation, frozen in time”.